Paul Wellenberger, Rocky Nickles and Dwayne Miller attended the Rockefeller “Uncommon Communities” initiative during 2015 – 2016. A presentation by Arkansas Community Foundation (ACF) focused on the value of a foundation to support growth and quality of life in communities outside the capabilities of City government. ACF manages over $200 million in funds for 27 countywide foundations in our state. They saw FFB as a unique, dynamic community, offering to engage us as an affiliate, expanding their business model to the City of FFB. Their staff of legal, tax, and investment experts are now part of our foundation’s resources. Three community members accepted the challenge of building our foundation. Two additional director positions remain to be filled. All director positions are unpaid, filled by volunteers. Operational expense for the foundation is targeted at no more than 10% of donated funding. All donations are tax deductible. Funding will be derived from grants available to foundations like ours and the generosity of our residents. A general fund is necessary to meet the 50/50 match requirement of most available grants. The FFB foundation has applications submitted for numerous grant awards. See “areas of interest” on our website for the scope of grants we seek. 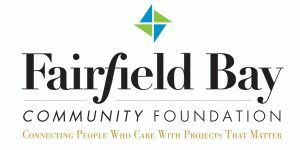 Additional information is available at www.fairfieldbay.community or LIKE us on Facebook at Fairfield Bay Community Foundation. You may also contact Mike Doyle at [email protected] or 479-871-7281.